A friend, the RBI Guv and why nothing’s right and nothing’s wrong! In any situation only do what you believe in and what you are comfortable doing. 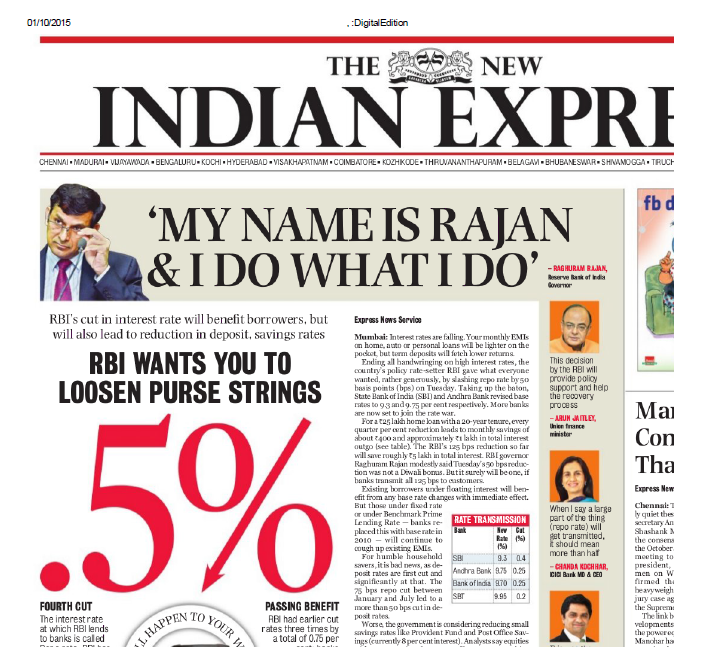 There’s great value in the discussion that RU and Rajan bring to the table. The whole world obsesses over what is right and what is wrong. If we get caught in splitting hair on this debate, seriously, no one will ever win. Because what is right to one may really appear wrong to another. And it is only because it appears so that people have differences of opinions and disagreements. It is this divergence in thought that leads to quarrels, fights, messy legal battles and often times a lifetime of acrimony. And it is this same right vs wrong argument that spawns crime, hatred and intolerance. I have learnt from Life that the best way to live is to only do what you believe in – no matter what. If you don’t believe in something but have to do it to please other people – often, family, friends, bosses or colleagues – you will be very unhappy with the entire experience. Now, when the experience is as trivial as attending a family dinner with folks that you have poor chemistry with, you can get over it once the meal is over or, at best, you will put it behind in you a couple of days. But what do you do when you have to keep toeing the line in a work situation with an autocratic boss in an anarchic system? What do you do when you have to sell your soul in a relationship where you are treated like a doormat? Well obviously, being the nice person that you are, you begin by adjusting, accommodating and working towards making the other party see reason. But when you end up having to suffer day in and day out, at some time, you will conclude that you can’t handle it anymore. You will then do what you must do – like walk out of a relationship or quit a job or refuse dinners with family members that you can’t relate to. When you do take a stance, in your own interest, people will make it appear as if you have sinned. They will say you must “grow up”. And this whole debate on what is right and what is wrong will erupt – and rage on. In any situation, four perspectives will be thrown at you. What is right, what appears to be right, what appears to be wrong and what is wrong. All four are relative. Simplify your Life. Rather than suffer yourself while pleasing other people, do only what you believe in, and what you are comfortable doing. This is the only way to inner peace. When you are at peace with yourself, magically, your world, and everything in it, falls in place! Author AVIS ViswanathanPosted on October 1, 2015 March 14, 2016 Categories Art of Living, Inner Peace, Intelligent Living, Osho, Raghuram Rajan, RBI Governor, Reserve Bank of India, Right, Suffering, WrongLeave a comment on A friend, the RBI Guv and why nothing’s right and nothing’s wrong!